I cannot say enough great things about this group. From excellent prenatal care, to an empowering, beautiful birth and incredible postpartum support, the Midwives are professional and provide loving care to you and your family. Having our first child with them was an experience my husband and I will treasure forever! "FOREVER DEAR TO MY HEART"
My last two births were assisted by the midwives. We couldn't have asked for better experiences. They considered everything that would play into the baby's and my health, including crazy circumstances in our life at the time. We have since moved half way across the country, but I've joked that if I were to get pregnant again, we would be moving back so Lynne and Jessica could be there for the birth. All of these ladies will forever be dear to my heart. Had four of my eight children with the midwives. My experience was amazing. My water births were excellent! I felt safe and well taken care of plus had control of how I wanted to give birth. I highly recommend these fabulous Midwives! Amazing experience. I love my midwives and wouldn't have anybody else deliver my children! I highly recommend them. As a first time mom I did not know what to expect from the birth experience. I knew that I was healthy and had complete trust in my body. I also had full confidence in the midwives. They provided amazing knowledgeable prenatal care. Then during the birth were attentive and encouraging. Having my baby in the comfort of my home made the transition into motherhood so natural. With only these women that I had come to trust and consider my friends present along with my husband I was very relaxed. The best decision I have ever made. I am thankful for the midwives plus think about how awesome my sons birthday was daily. I knew right away that this was the perfect fit for my pregnancy. From the friendly faces to the cute historic location, i felt a sense of comfort and ease that gave me confidence in my choice." My husband and I had the most wonderful experience with Midwives Cooperative! From our very first meeting, we felt confident in them and comfortable with the midwives. We interviewed the Birth Center first and just didn't feel as comfortable with what they had to offer. I loved that I didn't have to go to their office for my prenatal visits, but that they came to mine. They answered all of our questions, as they came up, and the childbirth classes helped to prepare us for what was to come. I loved that they gave me choices on how to proceed since my little one was two weeks late. I was informed and never felt pressured that I had to do something. On the day that I went into labor, Abigail came over to check on me and said that I was in labor so the setting up of the pool began. I labored in it all night while watching my favorite movie and tv shows to help take my focus off of the contractions. Amanda came over later in the evening/early morning and things were progressing. Being a first time mom, I didn't know what to expect, but we were so confident in the midwives that I never worried once about my baby or myself. Our beautiful baby girl was born about 12 hours later and it was one of the most amazing experiences of my life. I really felt like the midwives cared about me after the baby was born too. My husband and I are expecting our second baby girl and we feel so blessed that the Midwives Cooperative will be delivering her. Having a homebirth was always my dream! After having a hospital birth, I knew exactly what I wanted... A home birth for sure. I completely LOVE these midwives from the first day! All my prenatals were great and always were attentive if i had any questions and they always involved my toddler (he loved listening to his baby brother's heartbeat!). When the actual day came it could not be any better. Seriously, the words of encouragement were great, the helping me through it and keeping me involved in everything that was going on was amazing. I completely loved the alone time for my little family and i to enjoy our sweet baby boy. And the whole process was just AMAZING! Wouldn't have it any other way! DEFINITELY coming back to these sweet midwives for my next baby! 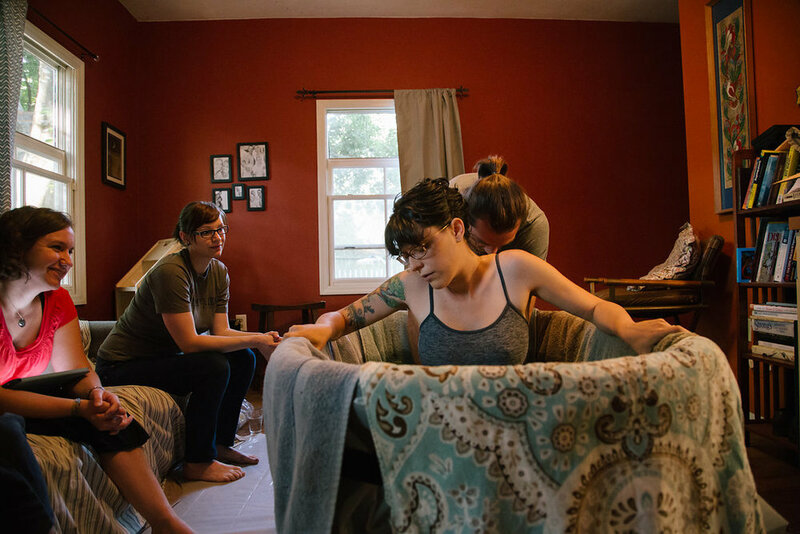 Right after meeting Jessica for the first time, I knew a homebirth with these ladies was the route I wanted to take for my first birth. I felt like I was actually being listened to and well looked after. My little Arolyn was born in just over 6 hours (from time of water breaking); faster than I'd anticipated for my first time! I attribute that to how relaxed and safe I felt with Jessica and Lynne; I knew Arolyn and I were in good hands. I wouldn't change a thing about that morning! Wonderful experience. I decided to have my 3rd and last baby at home and I was so glad I did. The midwives were so kind and knowledgeable, I wasn't the least bit apprehensive about the birth....and they made my home birth experience something I wouldn't have traded for the world. Joined the coop late in our pregnancy and it was and is one of the best decisions ever. We had the best care and most amazing at home water birth anyone could ask for. These ladies are worth every second of your time and every penny if their fees! !! My delivery over this weekend was anything but typical. .. and Jessica handled everything with a professionalism I've never seen and more compassion than I could have asked for. What an incredible experience working with these women. They are caring, professional, skilled. I am so thankful I found them and highly recommend going with them if choosing a home birth. Their back up support at the hospital and my experience there was unmatched. I feel so very blessed. It was so wonderful having dear friends present for the birth of our little boy. Always warm and friendly, always willing to listen to my needs, wishes and fears, they were companions on our journey to becoming parents. My birth was swift and Jessica and Daniela rolled with it. Forever thankful! There are no words for how much I love and appreciate these women. I had the most amazing birth in my home, in the water with Mandi and Lynne and it truly was the best day of my life. When I think back to this birth, I remember pure joy. Perfect labor, perfect birth, perfectly healthy baby boy and I owe it all to them. Thank you! I never could have imagined birth could be so easy until these women gave me the chance to do it at home. The midwives were all so wonderful. I was having my first child and really had NO clue where to go or what to do! After meeting with one of the Midwives she made me feel so welcome and accepted I immediately switched my care from my OB to the Midwives Cooperative! I had the best birthing experience anyone could ever have! They were supportive and encouraging every step of the way! I can't wait to have another baby just so I can have their support again!